Adorable American songstress Katy Perry was at her quirky best making the rounds at last week’s Paris Autumn-Winter presentations: she was even spotted donning a too-precious-for-words, panda-shaped earring by Hong Kong-based jeweler Qeelin. Katy’s quite frankly out-of-the-world ensemble was a showstopper at the Miu Miu front row at Paris Fashion Week, what with her mismatched earrings, teal overcoat, pink pleated dress—and electric blue ponytail. Fashion observers, for the record, Perry’s dress, emblazoned with graffiti-styled fire streaks, studded bag and outrageous heels were from Prada’s vintage car-inspired Spring-Summer 2012 collection. The finishing touch? 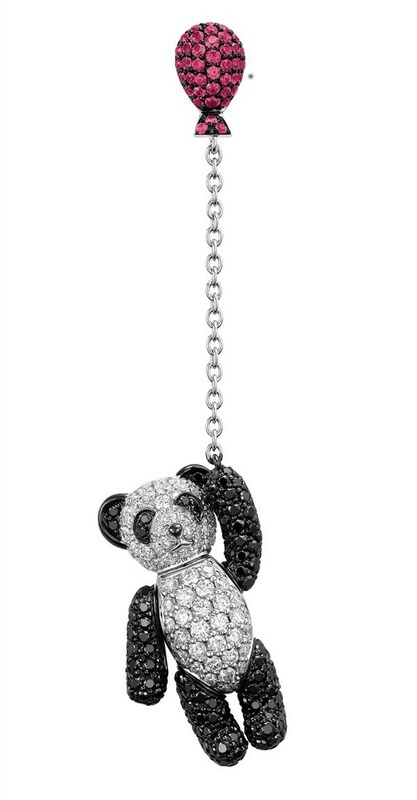 Qeelin’s Flying Bobo earring, made to look like a jewel-encrusted panda floating away on a red ruby balloon. The earrings were bought the day before, when Perry when shopping at Paris’ cult multi-label fashion boutique, Colette. Have a closer look at the miniature novelty below.